Protect Your Tools - Punch Pads! You spend a lot of money on your tools, and you want to protect them. But what's the right punch pad? Are they all the same? Should I have more than one? We're here to answer your questions with some quick tips for success! One of the sweet benefits of rubber or MDF over the UHMW is that they won't mark your work. Once you've punched many times into the UHMW, you'll feel that the plastic becomes rough and has a tendency to scratch your work, especially those beautiful oil pull-ups/waxy finishes. The rubber/MDF will work really well, but also keep your work looking amazing. For all of our general purpose cutting, our work table is covered in a large piece of UHMW, which works well (for years) for all types of cutting. A lot of people use Olfa Self-Healing mats as well, which are good, just not quite as long lasting. We find it beneficial to have pieces of UHMW, rubber, and MDF punch pads around, for different jobs (different tools, different leather, etc.). We have small pieces of MDF available for sale in our shop. Contact us for details! As always, if you have any questions, don't hesitate to drop us a line! It’s a type of microcrystalline wax that we use to protect our metal tools. Waxes tend to last longer and protect better than other materials, such as oil. The wax will create a protective barrier between your tools and moisture/oxygen, which can do them damage (e.g. rust or oxidize). You’ll want to use this product on the metal tools (steel or brass) that you touch most with your hands. We use it often on head knives, pricking irons, creases, punches, bevelers, etc. To use, apply a thin coat of wax evenly over your tools, and then buff lightly with a soft clean cloth or a piece of sheepskin. You’ll need to re-apply every so often. If you've got a damp shop, you might consider applying every 2 months. If you're in a more dry location, you could consider re-applying every 6-8 months. The small tin should last you a good long time. Drop us a line if you have any questions at all! We're happy to help! 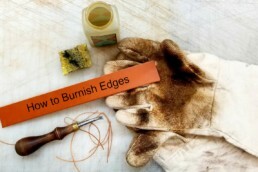 This video will show you how to burnish the edges of our leather products (belts, cases, etc.). As mentioned in the video, this is for vegetabled tanned leather only (natural, bridle, and latigo). Any chrome tanned leather is best tackled using an acrylic edge agent (also mentioned in video). Hope you enjoyed, and as always, if you have any questions at all, just drop us a line! How to Sharpen an Edge Beveler in 1 Minute! 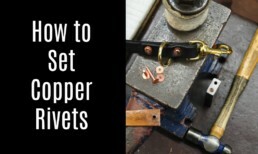 We've sharpened many edge bevelers in our lives, but these simple techniques will give you great results every time! The video shows clearly what I have difficulty putting into words, so please reference the video along with the steps listed below. And as always, if you have any questions, please drop us a line or pop in and chat. We're happy to show you how to do this in person. Step One: Hold the sand paper over top of the metal dowel, and slowly pull the edge beveler along the dowel. The point is to really get some sandpaper action onto the underside of the blade. You can pull it between 4 and 10 times, but it likely won't need more than that. Step Two: Now you can move onto the piece of leather and jeweler's rouge. As I mentioned above, we simply glued/epoxied a piece of 8 to 10 oz. leather on its side onto a piece of cardboard and applied some jeweler's rouge to the leather. This fits into the underside of the edge beveler and the "stropping" process helps remove any fine sandpaper lines. This will really help in the long run, when you're beveling a lot. Step Three: Finally, we used the little piece of string (also with jeweler's rouge on it - that's important) to polish the face side of the edge beveler. The string only needs to fit into the edge beveler, so nothing too large or it won't pull through. You don't want to sharpen this edge, but a good polish will really help it glide through the leather. You should be fine with a sharpened edge beveler for some time, but let the tool tell you. 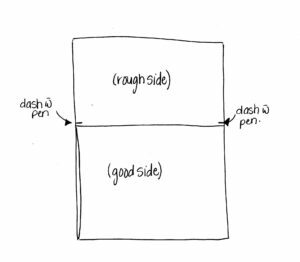 You should never have to put too much effort into edge beveling - the tool should be sharp enough to do most of the work. And often times, a simple strop (with the leather/jeweler's rouge and the string/jeweler's rouge) is all it needs before beginning a project. 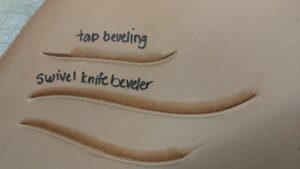 Make sure to keep the edge beveler as a good 45 degree angle on the side of the leather, and keep the blade/foot flush with the leather. You'll be able to tell by your results if you're holding it incorrectly. It should never mark the leather, only remove a tiny strip. If you're marking the leather, see which part of the tool is marking it and adjust accordingly. Thanks for checking us out! We're always happy to answer any questions. Ever wondered how to create a fold in thick leather?! When you're making a leather box, a bag, or really anything that requires a distinct fold, there are specific tools that will make your job a lot easier! I should mention that this works in thick leather. In the video below, we're using a vegetable tanned cowhide in 8/9 oz. First, a gouge is a great tool to carve a channel out of the leather in a direct line. This is the tool you'll see first in the video. Sean is using the tool up against a steel square to ensure a nice straight line. 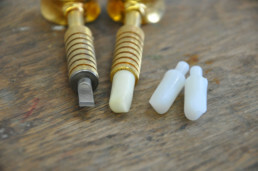 Gouges are available in different styles. What Sean is using is a vintage tool called a "carving tool." However, more common these days are "adjustable V gouges" or "adjustable U gouges." 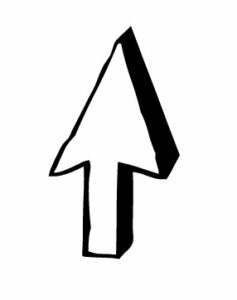 If you think about the shape of both of those letters, that's the shape you'll get from the tool. The adjustable part is handy so you can take less or more leather out depending on the thickness of the leather or the project you're making. The second tool Sean uses is called a French Edger. This tool can be used to skive down the edges of your leather, or as Sean is doing, take some directly out of the middle. Once he used the gouge to create the first channel, you'll then see him use the French Edger on either side of that gouge to take out another section. 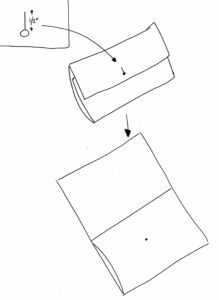 This allows room on either side of the channel for a nice fold. If you don't take this section out, the fold may have some trouble. If you have any questions about either of these tools, don't hesitate to drop us a line! We're happy to help! Things to do in The Village! The Village is our little area of downtown Hamilton, also known as the International Village BIA. It encompasses West Street to Mary Street, and King Street to Main Street. It's a cozy little nook that needs more attention, so here I am to shine some light on all the businesses that deserve it! Please note that the list below is just a personal list, and doesn't encompass EVERY shop in The Village. It's just the places I know and love. I should mention that in writing this post, I learned about more I should (and will) be checking out. For a comprehensive list, click here. Also, these notes were originally posted for Valentine's Day, so some of the sales/promotions have probably expired. But check out their IG accounts, FB pages, and websites for current info! Tianna, Chris, and Mina (and their team) have a sweet little nook where you can come in from the heat, cold, rain, etc., get greeted with a friendly smile and get a gooood cup of coffee with beans from local roasters (Vintage, Signal, and Relay). They also do teas lattes from Parkermann's Fine Tea Co. (I would recommend the Hamilton Harvest tea latte for sure). They have yummy in house made food, soups, and baked goods, and also feature outside bakers, including weekends donuts from Donut Monster, as well as various treats from the ever-amazing Cake and Loaf Bakery. I should also mention they have this adorable box of handmade cards from A. 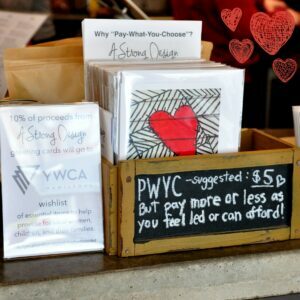 Strong Design, and some of the proceeds go to our local YWCA! Britney and Carina have got some gorgeous glass pendants in stock, made by some of the best flameworkers in North America. This one below is called "Flower of Life" and you've got to see it in person! It's amazing! 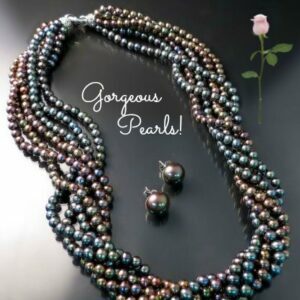 They also have a signature line of jewelery, which you can check out in store or custom order! Lisa's got the new shop on the block, and it's a great addition! She's got foodie treats that you can't find just anywhere, and a new home section with awesome soaps, lotions, candles, etc. Ok, now on to the important stuff...she's an AMAZING baker! Literally... the scones, muffins, and cookies are fresh baked daily and are to die for. She's got some awesome coffee and latte skills as well. 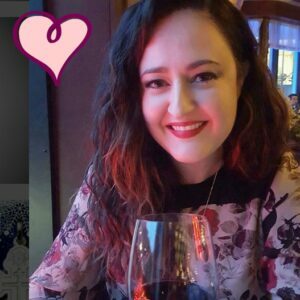 My initial post on the BIA's Instragram account was about Valentine's day, but I get the impression Lisa is going to make each holiday something special! 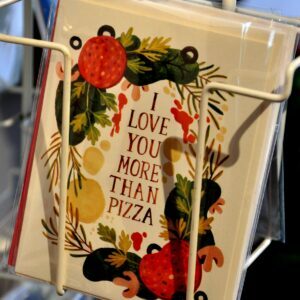 Her Valentine's game is STRONG! ❤Feature Valentine's drink is Raspberry Hot Chocolate (pictured), made with scratch made syrups. 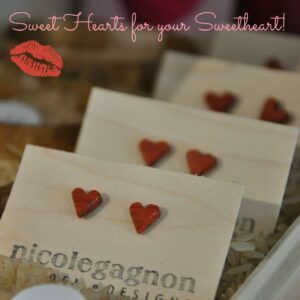 ❤Pre-order Valentines treats for you love, including cookies and chocolate dipped brown butter crispy rice hearts! ❤ If you spend $30 in store, she'll even gift wrap your purchase with a beautiful box and ribbon! Foodie lovers - this is a great gift! Melanie has made this yoga studio into one of the most friendly, inclusive, calming, and all around happy places I've been to in a long time! I took part on my first yoga class in 3 years the other day, and it was a Warm Vinyasa Flow class during lunch! The instructor (Pip) was very inclusive and welcoming. I didn't feel at all out of place. In fact, I felt right at home. Melanie also offers Aerial Yoga at lunch, too, which I'm excited/scared to try! She's got beautiful things for sale as well. Stop in - you'll be happy you did! Check out this awesome Rick and Morty wall! I'm a little embarrassed to admit that Toni and Jo had to tell me what Rick and Morty was....😳 These ladies are so friendly and their store is full up with awesome Cosplay accessories! 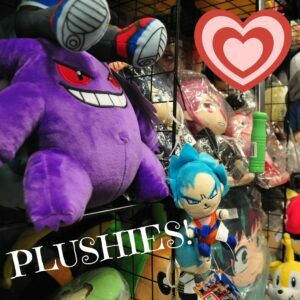 All of their plushies and mugs are 10% off until Feb 14th, and you can use the coupon code COSPLAYLOVE10 on their website (valid until Feb 20th)! Jess and Nick are super fun people and you can tell that straight away, when you walk into their awesome board game lounge. Not only do they sell ALL of the board games, but for $5 you can play any of their 1000+ games (and no time limit👍)! Did I mention Jess is an amazing vegan baker and they have beer? I feel like I can just stop there....no more words needed. Pop in, say hi, and play a game or two. I personally love Braintopia, which I maybe have purchased for more than one person this past Christmas. 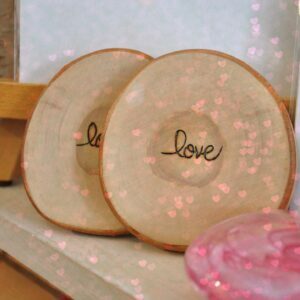 Whitney takes care in stocking her shop with the most amazing lovely little things! 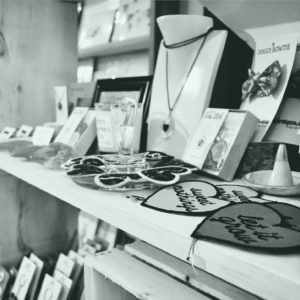 I think her website sums it up - "vintage clothing and nostalgic wares; a well-curated collection of lovely little things; each piece is part of a lifestyle focused on beauty, whimsy and dreams." You get that feeling immediately when you open the door. 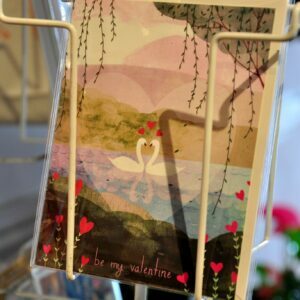 Currently, you should pop in to see her awesome stock of Valentine's Day cards! There's one for everyone! Julie has helped me build almost my entire collection of John Irving works. She's very well-read and can help you find specific titles when available. Julie has a wonderful selection of new and used books. 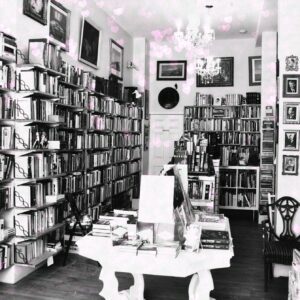 She only stocks the best in gently used literary fiction, classic literature, award-winning Science fiction and Fantasy, and scholarly and general non-fiction titles. Her new books focus on local authors, which is awesome! 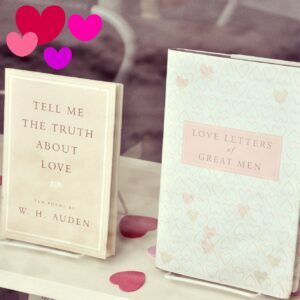 ❤ Pop in to see her selection of Valentine's day books, while they last! 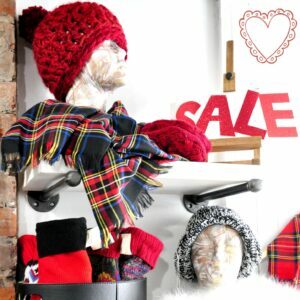 They've got an amazing selection of vintage/previously owned clothing and accessories. Sadly, they're leaving us soon (they've got a primo spot on Ottawa Street starting March 1st, so they're not far), so take advantage of their clearance section! 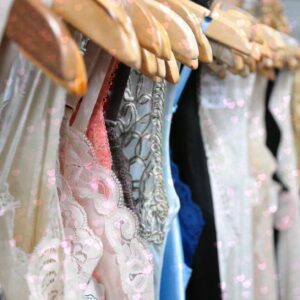 All the dresses that are already marked down, take an ADDITIONAL 10% OFF! I've been getting my band tees here since as long as I can remember. 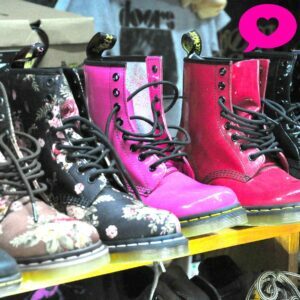 And I think I'm in love with these Docs! Since 1984 (!!) 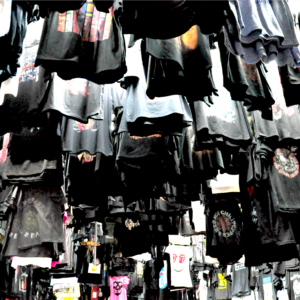 Rock 'N' Tees has been serving the local community with everything Rock and Roll, including band merch, custom printing, converse, Dr. Martens, Vans, etc. ❤ Yea, you could probably get this stuff online.. but why would you? Next time you need some cool Docs or Vans, pop in. You'll be excited by the selection! Nadine and Jen are super fun and have total taken co-working in a new direction with their studio. It's a membership based space for crafters who don't want the hassle of trying to work from home. You take out your stuff and put it on the kitchen table, and then you put it all away in time for dinner? No thank you! You can leave your stuff out in this shared studio space (with your own designated "area") and work on it as you can/want to. They also offer some classes and events, and they're very community based! I don't have any pics because everyone was busy working when I went by, but what do you expect? Check out their IG and FB pages for lots of fun pics! 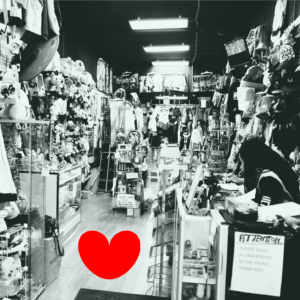 Mel, Vito, and Trisha are so welcoming and friendly, you'll feel right at home when you walk in! 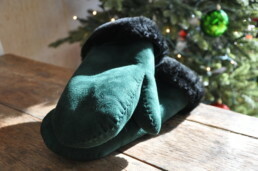 They have an amazing selection of 100% CANADIAN MADE products, with something for everyone. I literally can't go in without finding something I want to purchase. They have also have yummy treats and make a good strong coffee or latte. 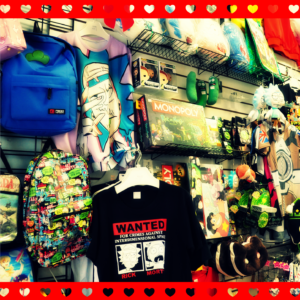 They have a big selection of Valentine's gifts and cards for guys and gals, as well as FREE gift wrapping (every day)! The Fizz opened up last year and Trevor's got a bunch of yummy sandwiches on the menu. We needed a lunch spot downtown, and he's definitely delivered. Also - I love soda water, and Trevor does all kinds of yummy sodas, featuring real fruit flavouring! Yum! Check out his website for pics and information. He also uses Skip the Dishes!! It's amazing that we have a theatre this close to us, and I personally need to take advantage of that a little more. They've got three shows on from now through May, and they all sound great. I'm literally looking into tickets right now. We've got some great talent in our city, so check it out! Leslie reuses, recycles, repurposes, and repairs quality used clothing. 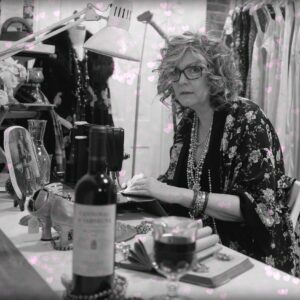 She's also a hoot; she works with wine on her sewing table so she's a girl after my own heart! 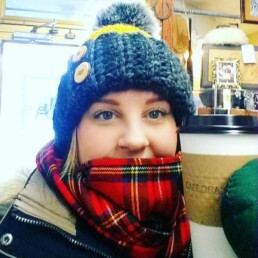 There are so many wonderful items in store, and you can see the scarf I purchased at the top of this post (it used to be a kilt)! If you're looking for contemporary arrangements, or something different/specific, Tasha has something for you! She can definitely help you with any of your floral needs. Her shop is new, but it fits right into our little village. Pop in and see what flowers she's got in stock! She's also got a section of modern gifts - so cute. I love the pride I feel when I put on my Hamilton is Home shirt! Max did a great job by making us feel even more united! If you haven't been in lately, you've got to see some of the cool stuff in store! Everything you need to show your pride in your city! This is our shop - check out the rest of your site to see what we have to offer. Have a custom leatherwork project in mind?! Message us for details. Need some help with pricing leather, tools, and supplies? Send us an email! Fender Custom Shop and Master Built Guitars, their stuff is absolutely gorgeous! So many one of a kind guitars and over 300 Fender Custom Shop Guitars! Stop in if you have any questions for them! Maja has an amazing eye for gorgeous jewellery, and a wonderful selection of unique jewellery! I've definitely got a few lovely pairs of earrings from her shop and they're top quality! Maja also likes 🍷 (another girl after my own heart)! If you're looking to learn to make your own clutch purse, you've come to the right place! 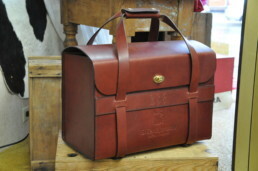 If you don't know already, we are a leather supply shop in Hamilton, Ontario, and we sell everything you need to make your own leather goods. 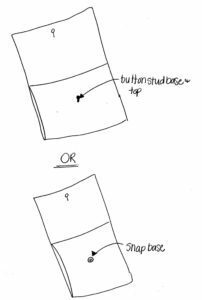 In this post we'll specifically go over what you need to make a clutch purse, and how to do it! If you're in the area, we also offer DIY Clutch Purse Classes! You can check out all of our current classes here. - Leather (5/6 oz. 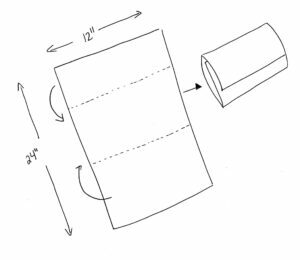 in thickness, approximately 12" x 24") - for more information on thicknesses, click here. 2. 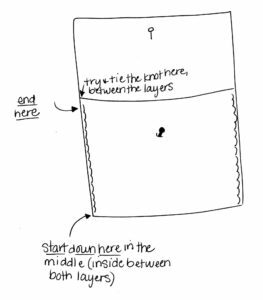 With the good side facing down, fold your leather into a clutch shape, by folding the bottom piece up into the middle, and then the top piece down. It should look like a little clutch purse. You can play around with this until you get the size/shape you want. At this stage, you can play around with the flap, to give you whatever look you're going for! 3. 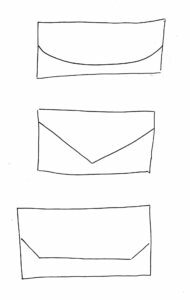 Open the top flap so that all you have is the bottom part folded into the middle (like the clutch is open). Mark two little dashes at the sides of the leather with pen, so you know where to glue! 10. 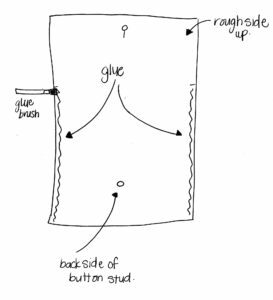 Mark your stitches onto the leather with a pen (we use a template made out of cardboard, but you can also use the metal square) - to make the cardboard template, measure 1/4" or 1/2" in from the edge of the cardboard and draw a line. Then measure 1/4" or 1/2" apart along that line, and draw small lines. When those lines intersect, punch a hole. This will give you an easy template to use over and over again. 17. Do the same stitch on the other side, and you're all done! If you have any questions about this blog post, or about purchasing tools/materials, don't hesitate to click here to drop us a line! We're happy to help! Click here to check out our January - March 2018 Class Schedule! Sign up online, by phone, or by email! How to UP your Stamping and Tooling GAME! 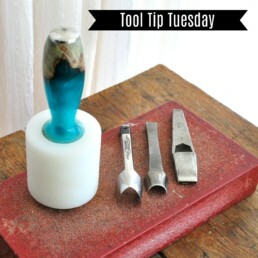 Stamping and Tool - Here's a Time-Saving Tip! Do you ever get so frustrated sitting at your work station tap..tap...tapppping away at your project? Did you know you can save SO much time by using a plastic swivel knife beveler, as opposed to a craftool beveling tool? Above is a picture of a swivel knife with a blade (left) and a plastic swivel knife beveler (right). It's got a straight edge, which you put into your swivel knife cuts (similar to a beveler tool), but instead of tapping away, you drag it along, as if you were cutting. It takes a decent amount of hand pressure, but the results are amazing! Check out the smooth appearance of the two bottom bevels (using the plastic swivel knife beveler), as opposed to the top bevel (using a regular craftool beveler). It really gets into the cut to burnish the leather. Here's a video showing the time savings! Thanks for reading! Let us know if you have any questions!